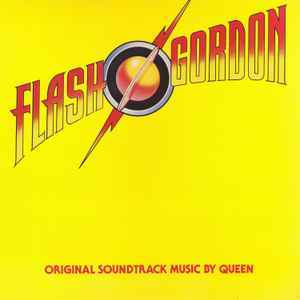 This grouping gathers together all versions of the "Flash Gordon" soundtrack album, originally released in 1980 on vinyl and tape, as well as subsequent repressings and bootleg versions. Officially, the entire back catalogue was re-issued for the first time on CD in 1986, and again on CD/tape in remastered form in 1991 for the US market (via Hollywood Records and adding a few non-album tracks or remixes not included on the original versions). Parlophone also re-issued the remastered versions in 1993/1994, and subsequently several additional re-remastered versions (some in glorious 5.1 DTS) have appeared. Starting 2009, the entire back catalogue of studio albums (now remastered) is being re-released again, this time on heavyweight vinyl. Printed inner sleeve with pictures on both side (one side Queen, other side movie actors) plus a single sheet with credits and some lyrics on one side and "Ming" plus the name of all the actors on the other side. Two more questions: Is anyone aware of a version like this one, but with a mistake where the side 1 label was affixed to both sides...no side B label? I have one like this. And, should I create a separate entry for this? In the "Barcodes and Other Identifiers" section it says "SE-518..." on the first two lines. Is this correct, or should it say "5E-518..."? Is this O.S.T. really by Queen??? Yes it is!!! And I am still trying to get my head around it even today 37 years later! Those dark and moody synths are incredible! Future generations i.e. producers have sampled this numerous times! Plus I remember hearing certain parts of this LP being mixed in to other tracks on a ColdCut session on KissFM back in the day (A few hours before Princess Di's untimely death I'm sad to say).. Anyway this is a soundtrack that will be listened to by further generations 100% guaranteed! I think this may be my copy has 2015 and Virgin Records ...but the bar code is different. Mine has 050087328924. Is mine a different one?? My copy has got a white tape with RED print not blue.